Artichokes are edible members of the thistle family with two prime growing seasons: early spring and late summer. It is believed that 85%% of all artichokes in the US (and 60%% in the entire world) come from within 10 miles of Castroville, CA, though artichokes are native to Italy and Sicily. Ripe artichokes will squeak when squeezed, meaning that the leaves are crisp. Look for bright-green artichokes that are heavy for their size; heavy means there is a lot of meat on the leaves and a large heart. Black spots on the leaves are simply oxidization; though unattractive, they do not mean that the artichoke has gone bad. The length of time an artichoke is cooked will affect its flavor due to a compound called cynarin, which has a property that makes any food tasted afterward seem sweeter than it actually is; the longer an artichoke is cooked the more subtle the flavor and cynarin's effect. Bold foods, such as olives or garlic, compliment artichokes that have been minimally cooked, while milder flavors, such as prosciutto or mayonnaise, go well with longer-cooked artichokes. Though cooking is a common way to prepare artichokes, they can also be eaten raw: shave raw hearts and serve with olive oil and Parmesan cheese for a simple salad. Artichokes will keep around a week in the refrigerator in a paper bag; be sure not to wash an artichoke until you are ready to prepare it, as the moisture will eat away at the peel and invite mold. Choosing: A good test of freshness is to press the leaves against each other which should produce a squeaking sound. Browning of the tips can indicate age, but can also indicate frost damage. Aged, dry artichokes should be passed over, but those with a little frostbite on the tips are considered the best by many, so use the squeak test for freshness. Extremely hard outer leaves and those that are opening or spreading out mean the artichoke is old or over-mature. Size has little to do with quality or flavor. Small artichokes are just a smaller bud. One plant can produce up to 30 chokes of different sizes. Artichoke hearts are also available canned and frozen for time-challenged cooks. Procuring: Once the flower matures, the artichoke becomes inedible so the buds are harvested by hand before flowering. In warm climates, the artichoke is grown as a perennial; in cool climates, as an annual. The small purple Provenćal artichoke is the only variety of over a dozen that can be eaten raw, since it has an underdeveloped choke. Now California produces 100 percent of the U.S. commercial artichoke crop, rivaled in popularity only in France and Italy. Although baking, boiling and steaming are the most popular cooking methods for the basic stand-alone artichoke, it can be used to enhance many dishes. Pressure-cooking is a quick and easy way to prepare artichokes. Artichokes are fully cooked when a bottom leaf can easily be pulled from the base. Cleaning: To eat the cooked artichoke, simply pull off each leaf and draw the base of the leaf through your teeth to scrape off the soft portion, discarding the rest of the leaf. As you progress upward from the base, the leaves become more tender, with larger edible portions until you reach the choke (the undeveloped flower). Remove and discard the "hairy" choke, then dive into the hidden treasure known as the heart. Use a stainless steel knife to trim the artichoke and avoid iron or aluminum cooking pots to which can cause discoloration. 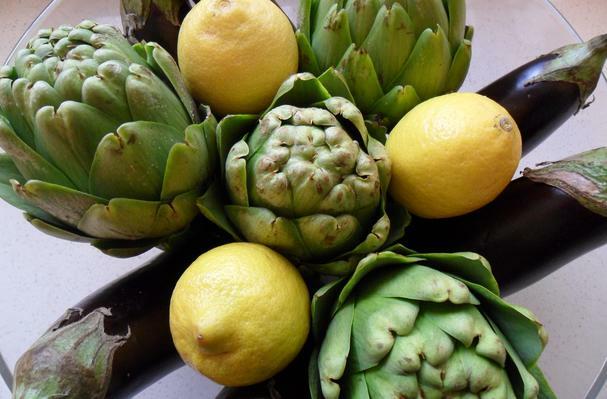 Fresh artichokes may be stored unwashed in a plastic bag in the refrigerator for up to one week. However, since you don't know how long they've already been on your grocer's shelves, it's best to use fresh artichokes on the day of purchase. Cooked leftovers can be refrigerated up to four days. Artichokes must be cooked before freezing. If you freeze them raw, they will turn brown as well as suffer in taste and texture. To freeze whole cooked artichokes for later use, drain completely, wrap tightly in foil and pack in plastic freezer bags or other airtight container for 6 to 8 months at 0 degrees F.
According to Elizabethan folklore, the artichoke was created when a beautiful woman angered the gods and was turned into a thistle. History: Although mankind has been eating artichokes for more than 3000 years, the fall of Rome plunged the artichoke into obscurity until its revival in Italy the mid-15th century. Great advice and info. One question; if we freeze, how do we heat up again to retain flavor?